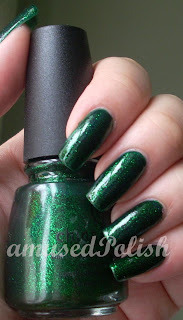 A long time ago, before I got addicted to polish, there was a green polish by Manhattan which I wore and loved (I only had a hand full of polishes, a few for french manicures and a vampy berry tone). I sadly don't remember the number (all Manhattan polishes have names instead of numbers). All I remember is, that it was slightly a duo-chrome/shimmer and was a medium green.